The sad thing? Dad would have loved to see the ACLU bring that suit. But our family could not get fire insurance because word was out that the Ku Klux Klan would burn us down. He had to choose between his kids and a greater justice. He chose his kids. We were sent to finish the school year in Minnesota (not Wisconsin—all newspaper accounts have errors). If Dad ever had a second thought about that, he never mentioned it. We left Dog Land after that. The Klan never showed up, maybe because Dad let it be known that he had a shotgun and was prepared to use it. The school was integrated, and the daily prayers ended. 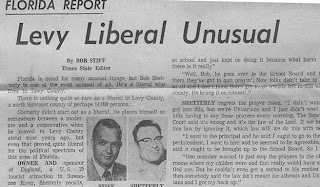 Whether that would've happened the same year if Dad had stayed silent, I can't say. All I know is that he was on the side of justice, and I'll always be proud of him. P.S. I'm just as proud of Mom. She opened some of those letters and answered some of those phone calls and stayed brave before her children. 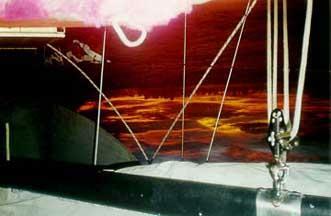 Dad left La Paz, Baja California, Mexico, on May 15, 1998, sailed once around the world in a small sailboat, the Vaya, then decided to do it again "now that I know how." 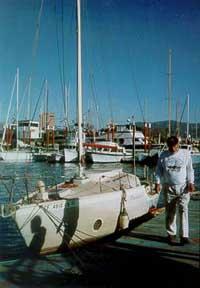 He returned to La Paz on his 78th birday, July 9, 2004, then sailed on. 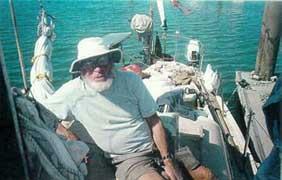 His circumnavigations ended at the age of 79; he hurt his leg in the Philippines, gave the boat to the people who helped him there, and flew home to Edmonton in July, 2006, shortly after his 80th birthday. To die in a storm with the adrenalin pumping, fighting for survival, seems far better than anything civilized hospital care has to offer—even a collision at sea would be preferable. If I go unreported, I hope no one starts or creates any search. Ships that run down small boats do not report the fact, even if they are aware of what happened. On the other hand, a coastal wreck is usually reported, unless everything is smashed to bits in surf and rocks. In either event, I see no need to waste anyone's time and effort.To sum up: I am grateful to the Gods and the people who have provided and supported an interesting life. I have many regrets—more for things not done, than for those done badly. I recognize that this letter is only about my concern, but I am aware of the concern of others. Having made the selfish decision to live out my declining years on my own terms (as much as possible), this letter is simply to try to answer "Why?" and to make it clear the "why" has almost nothing to do with others. 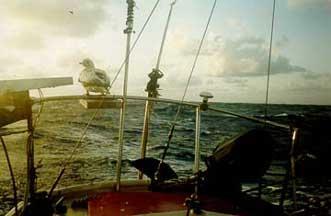 Since he left, he has been sailing solo in a small boat—not so much following the winds as chasing them. He wrecked a 20-foot boat off the coast of Mexico when he was attacked by killer bees, and swore that he would not sail again. He set out on a bicycle from Canada, intending to reach Tierra del Fuego, but he was beaten and robbed in Central America. After a heart attack, a doctor told him that given his age, his diabetes, and his partial deafness, he should take it easy. My rear end is suffering from all this sitting, and constantly wet from salt water. Just no way to stay dry in cockpit when wind and waves are up. Using vaseline liberally. Keep thinking of those galley slaves chained to their oars—my situation not comparable, but I'm developing an empathy for them. My mom met him in Australia. They bought a used camper van and spent the winter seeing the country. In the spring, Dad set out again in the Vaya. 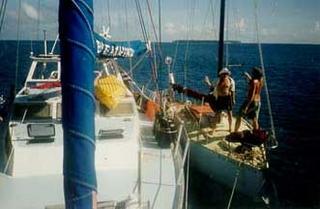 His adventures included three nights with the boat on a reef, until a very high tide carried him off. He spent an idyllic month on the Chagos Archipelago in the middle of the Indian Ocean, then sailed on. I am in Mayotte, a French possession. The French-made Navik wind vane steering broke again about 600 miles from here. I consider the self-steering essential for a 73-year-old single-hander. As this was the nearest port, I entered on an emergency base for repairs. I told them if they did not want me, I would leave—they said only after I paid a fine. I said that did not seem right. If someone drives up to the French border and customs does not like the registration papers, they can certainly refuse entry, but it would not seem to me the car could be seized. After I absolutely refused to pay a fine, they are thinking it over and will apparently get back to me in a couple of days. Meanwhile, I am restricted to the boat, and the boat must stay at anchor.Call the Canadian embassy and ask what office I should contact if this nonsense continues. After a few days and a few phone calls, the authorities decided that life would be much simpler if they let Dad continue his voyage. He sailed on to South Africa. Mom met him there for some travels on land. 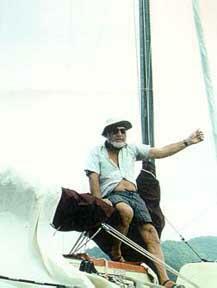 In March, he sailed on to St. Helena, and then Tobago, Trinidad, and the coast of Venezuela. Carupano, Venezuela. I must have been sleeping the sleep of the dead, or they must have come on board very quietly, but I woke with a body on top of me and a knife at my throat.There were three young banditos. They soon had me tied hand and foot and pulled up against the entrance-way, with the knife still at my throat. When I realized it was the dull edge of the knife pressing on my neck, my sense of terror receded slightly, but when they demanded "A donde dinero!" (Where is the money! "), I rather quickly indicated where my billfold was. It only contained $15.00 U.S. and about an equal value of Bolivars. I explained I had been robbed in Trinidad and that was all I had. I also went into my 74-yr.-old bad heart routine. As things calmed down a bit, my courage returned a bit, and I screamed "Ayuda!" ("Help!"). Probably a mistake as it prompted a rather forceful and prompt gagging and manhandling. I slumped down, more or less semi-conscious, and the young bandito who seemed to be assigned to controlling me loosened the gag. He kept repreating "Tranquilo" ("Quiet"). I said "Si, si," and he quickly removed the gag. I asked for my "medicino" and pointed out that if I died, my problems were over, but mas problemas for them. As I understood it, the fellow holding me wanted to give the medicine, but the others were ransacking the boat. As best I could, I tried to convince my minder that three young guys robbing an old man was not very heroic, and I began to get the feeling he was not too happy with the situation. After a short time, he shouted something I could not understand, and the other two went barreling past us into the cockpit. He held up the gag and once more said, "tranquilo." I said, "Si, si," and he quickly left without gagging me. It took me a little while to get myself untied. False teeth are not designed for untying knots. By the time I got to the cockpit, I could not see anything—and still don't know what frightened them off. All things considered, I got off rather lightly. Some bruises in and out of my mouth, and wrists bruised, slightly swollen, but nothing serious. The list of things taken is rather interesting: all flashlights, 3 amp-meters, binoculars, Sony Walkman, radio-tape player (but not my small or large HF radios), 2 watches, 2 L brandy, 1 fire extinguisher (I had two, one discharged—and that was the one they took), my good hand-held compass (it was mounted in the cabin so I could check course without going out), my blood pressure kit (it was inoperative). When you consider that they handled two hand-held Global Positioning Units, as well as other valuable equipment, the things they took are relatively minor. Obviously, I will need to start closing and barring the door, despite the lack of fresh air, and begin devising more deterring efforts. Will get fog horn, 12 volt, with switch by bed, so that once turned on will not be easily silenced. Saturday I went to the local market... most exciting, one booth was selling tobacco by the leaf, and when I asked about cigars, he produced a bag of 100 for $4 U.S. They are not bad, much better than cheap U.S. made and certainly half as good as $3 Cubans. Despite the bandito episode, I think I will enjoy Venezuela, as with that one exception, everyone has been very nice. When you see a small sailboat, think of him. Bob and the Vaya in Baja California. 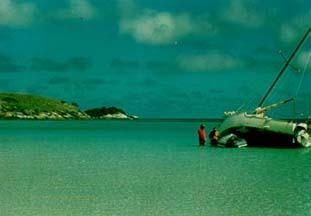 Visiting in the Indian Ocean. That's not the yacht's dinghy that Bob and another fellow are on. That's the Vaya. Joan and Will near Ensenada, Mexico.